Supplier & Distributor of Deep Search Metal Detector & Deep Search Metal Detector RE-P-72 E. Our product range also comprises of CCTV Camera, CCTV DVR Video Recorders and Accessories and CCTV IP Megapixel Camera. 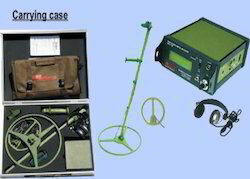 With firm commitment to quality, we are presenting for our clients a vast range of Deep Search Metal Detector. Our given metal detector is developed with top quality components & contemporary techniques in conformity with the set norms. This metal detector having user friendly menu driven operator interface, making it easy to use in the field with minimal operator training. Offered metal detector detects both ferrous/Non ferrous metal under water & underground through bricks wall. Telescopic rod : min 695mm, max. 1750 mm. Power : 12V NIMH Rech. Battery Pack. Humidity : 95% RH. Non condensing. With a precise understanding of the relevant industry, we introduce ourselves as the leading wholesaler, trader, distributor & supplier of Deep Search Metal Detector RE-P-72 E. This metal detector is most suitable for deep penetration underground search. 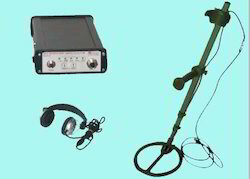 The offered metal detector is developed in adherence with the set quality standards using high quality components and latest techniques. In addition, we also offer this metal detector in a variety of specifications as per the need of customers. 20 characters x 4 line LCD display for various functions, parameters & setting. Search Coil : Two search coil-15” & oval shape 8” x 10”,Telescopic Metal rod. Power : 12 Rech. Bty Pack. Audio : Variable audio & bargraph for detection signal. Head phone provided. Packing & Storage : Light weight aluminum box with cushioning. Looking for DEEP SEARCH METAL DETECTOR ?